Fans of Northeastern asphalt stock car racing are a divided bunch. Some are extremely loyal to asphalt Modifieds, while others are strong followers of fendered stockcars, like Pro Stocks (Super Late Models). So it’s not unusual for Speed51.com to cover both forms of racing in any given weekend. What is unusual is that this coming weekend, the website will be covering both types of racing as they venture away from the Northeastern United States. All told, Twist will witness 500 laps of feature race competition between the two tracks, plus heat races at NBIS and a 50-lap last chance event at Martinsville. Speed51.com will have full coverage of both the NASCAR Whelen Modified Tour at Martinsville Speedway (VA), as well as the Irving Oil 250 at Canada’s New Brunswick International Speedway. Correspondent Mike Twist will be at Martinsville on Friday and Saturday before hopping a couple of flights to hopefully make it to NBIS in time for heat races. 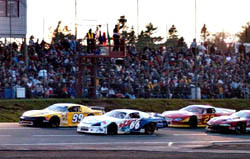 site fuels your Short Track appetite for NASCAR's Grand National and Elite Divisions, NASCAR Modifieds Tours, the USAR Pro Cup Series, Super Late Models from all across the country and much more. 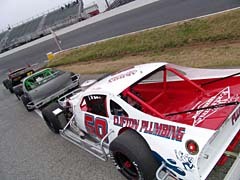 Speed51.com's Mike Twist will get to see Pro Stocks in Canada and Modifieds in Virginia this weekend. Twist won’t be the only busy member of the Speed51.com family this weekend. Jeremy Troiano plans cover the Big 10 race at Concord Motorsport Park on Saturday night and the NASCAR Whelen Southern Modified Tour at Ace Speedway (NC) on Monday. Justin St. Louis will also bring fans a full report from the $10,000-to-win Labor Day Classic at Thunder Road Speedbowl and then hopes to head down Interstate 89 on Sunday evening to cover the IBG-PASS and True Value Modified Racing Series doubleheader at Canaan Fair Speedway (NH).